Just got this one in my email a few minutes ago. Looking at the picture up close, who do you see? Clue: a famous scientist. How about if you move away from your computer monitor say....15 feet away. Who do you see now? Pretty cool, eh? I've seen this one before but I forgot to post it. it works. 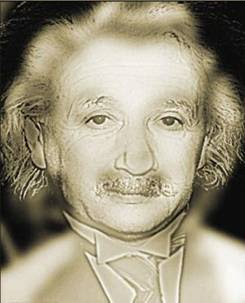 Albert Einstein, then Marilyn MOnroe? tama ba?